It became the Palace Cinema in 1921. 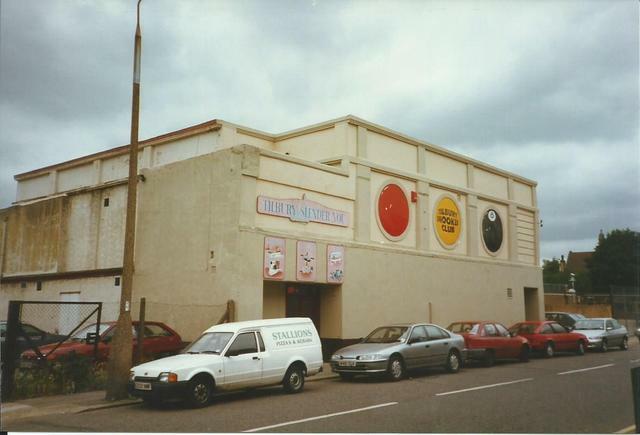 The Palace Cinema closed in 1959 and became a snooker club and bingo club. My father Bill Cowin worked as a projectionist for a short while in the early 1950’s. At the same time there was another projectionist called Fred Sharp. I think Joe Hanks was the owner. I have vague recollections of going into the projection box when I was maybe 5 or 6 years old. I seem to remember two large cine projectors and a third still projector which I think they used to put messages on the screen. Fred Sharp used to visit my mum and dad each time they returned to the UK, usually once a year to visit family. Mum said that they lost contact many years ago but apparently as you say they did return to the UK for a while but then they went back to Australia. If Fred Sharp is still alive he would be 98 years old (born 1916). I think he was a lot older than Sarah. Cath Dobbs mum was Mary Dobbs and her father was called Titch. Mary, Sarah (married Fred Sharp), Cath, Evelyn, Betty, Harry and Jimmy. They used to live at 23 Thackeray Avenue. In response to Cliff Cowin`s report about Fred Sharp. Yes he was the projectionist when I used to attend the Sat morn kids shows. He married one of the usherettes, (Cath Dobb`s older sister) They emigrated to Tasmania Australia. After a few years because of his wife`s homesickness they returned to UK in the 60`s and took over the cinema on Portland Bill. THE REGAL (in my memoirs I describe taking the projection equipment from the Bug when it closed down to THE REGAL) I remember Fred as being quite bald. He was a very nice bloke. And gave me the Changeover units from the bug projectors, which I used on the recent remember the Bug Hutch afternoon. Rod Downe’s has provided us with his memories about working in the Bug Hutch. I was a regular at the Saturday morning performances when I was about 9 or 10 and can remember sitting in the middle rows. The older boys and girls would be sitting at the back and they all seemed to be having a great time. As a film was being shown something hit me on the back of the head – it was an egg. I did not dare to turn round and have a go – I just sat there, with the yolk etc. running down my neck, until it was time to go. All my mates were laughing at me when we got outside since my hair was now standing erect from the egg that had hit me. When I got home my Mum asked what had happened and when I looked in the mirror I could see why my mates were laughing. Funnily enough, for once, my Mum did not tell me off – She was quite sympathetic on this occasion but I think she had a giggle too. Happy, happy days !